Mylar bags are popular for their good puncture structure, outstanding barrier, and relatively low cost characteristics. Thickness of bag is 5 Mil. Mylar bags are the industry standard when it comes to food or product/part packaging. Used extensively by the Military it's one of the most popular bags available on the market. 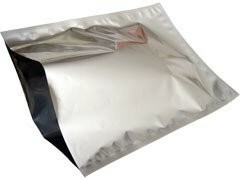 Mylar bags (foil pouches) are used for long term food storage because the metal barrier protects food and products from moisture, light and oxygen. Mylar has a very good MVTR rating (Moisture Vapor Transmission Rate) which prevents air from getting in or out of a properly sealed mylar bag (foil pouch). These bags are popular due to their good puncture structure, outstanding barrier, and relatively low cost characteristics. These Mylar Bags are open top bags (no zipper seal), they are heat sealable using an industrial vacuum sealer, heat sealer, or a device that applies heat like a household iron. Food Storage, Collectibles, Coins, Antiques, Watches, Hearing Aids, Electronics, Shipping, etc.